Happiness Bread is a soft savoury paleo bread, perfect for kick-starting your day, nay your year. It is also pretty much summing up the January I am having so far, I am feeling so positive and sunny that I really don’t recognise myself. I feel like I have changed drastically since giving birth 18 months ago. Not just because I have become a mother and all that entails but I have become less tolerant, more irritable and my sense of humour has drained dry. Also since my downtime is non-existent I never really relax. Basically I am joy, hey come and meet me. But the major thing that has changed about me is my appearance. There’s no discreet way to approach this but I have put on a lot of weight. Okay so I have never been a size zero. I have always fought a vicious battle with my body and only have to think about a Cadbury’s Caramel to put on another kilo. But since I ballooned during the first sleep deprived months of motherhood my body has been resolute in its new- found magnitude. Despite what my clothes size will tell you I am actually quite a healthy eater. Salads are an obligatory part of my day, I avoid gluten, I only drink in moderation and I don’t eat junk or processed food. So why have I been rolling around North London like a beach ball this past year? Well, okay my food choices have relaxed slightly and I am eating more. Way more to counteract my everyday exhaustion and I do eat more cake than I used to due to baking for a living and recipe testing. Although what’s really changed is my fitness which has take a drastic nosedive. I am not a natural keep fitter but I have taken pride in the fact that since taking up training 8 years ago I have strived to subvert my tendency to curl up on the sofa with my cats by going for a run or doing a CrossFit class. However after giving birth I have had two minor but significant setbacks. My back pain, caused by residual pregnancy issues, became so severe that I struggled to pick up Cole at all and I have a Morton’s neuroma which has meant running, jumping or any form of using the ball of my foot during exercise has been excruciatingly painful. I completely lost confidence in exercise as my body hurt too much, I stopped training and went downhill. Well these past couple of months have seen a little improvement, thanks to the amazing work of my physio, osteopath and personal trainer. My back has finally begun to loosen up, my Morton’s neuroma, although not gone, has become more manageable with a rigid exercise plan and I have just started doing cardio and actually working out again. As my body has been feeling better I have had more energy. So much so that I am now taking control of my diet; meal planning, mindful shopping and food prepping at weekends for the coming week. Plus it has helped that Cole is currently happy to stand on a stool and watch mummy make dinner, as opposed to running around the kitchen ripping the knobs off the oven and turning the dishwasher on and off. With this small change I have been able to eat better, eat less and have given up drinking, caffeine and sugar this month. I feel almost terrific and vaguely saintly. Having a loaf of Happiness Bread helps me out immeasurably during the week. Baking it is a two-step process as the sweet potatoes need to be cooked before you can begin. I have started making sure I chuck a few sweet potatoes in the oven every few days if I know I am going to be at home for the next couple of hours. Cole thinks sweet potato is the best food invented so it’s a must to have some for him on dinner standby and then if I have the baked sweet potato on hand it only takes about 10 minutes to get this loaf mixed and in the oven. 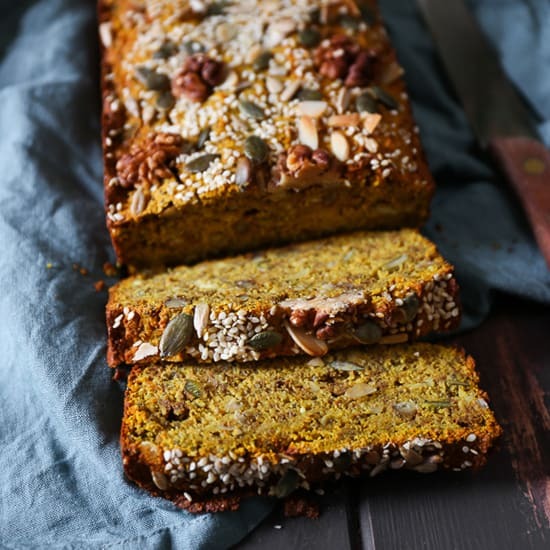 Happiness Bread is hearty and filling, packed with protein in the form of nuts and seeds and full of goodness thanks to the sweet potato, coconut oil and turmeric which is incredibly good for you. Turmeric is an antioxidant and has strong anti-inflammatory effects and is a great ingredient as you don’t need a lot of it for it to be beneficial. Plus the colour makes this bread so beautifully sunshiny. The coconut and turmeric flavour really come through and it is so delicious just slathered with butter or piled high with turkey and avocado – my current favourite way to enjoy it. This is a paleo bread as well so ideal for anyone following that lifestyle and that means it is also gluten-free. The texture is almost cake like so cannot be used the same way you would use a sandwich loaf but it’s a great start to the day and will satiate you until lunchtime. Since introducing this bread to my morning routine I have felt very happy, it’s not just about the bread but having an easy and filling breakfast has definitely contributed to my general feeling of well being. Plus to cap it off I have even just finished reading a book, a trashy thriller mind, but a book nonetheless – so take that no downtime! A soft savoury gluten-free and paleo bread, packed with sweet potato, nuts, seeds, coconut and turmeric. Perfect for kick-starting your day, nay your year. Pre-heat oven to 170°C and line and grease a 9 inch loaf tin. Beat the sweet potato, eggs, cashew butter and coconut oil in a large mixing bowl or food mixer. In another mixing bowl combine the coconut flour, tapioca flour, walnuts, chia seeds, almonds, pumpkin seeds, sunflower seeds, sesame seeds, flaxseed, turmeric, baking powder and sea salt. Tip the dry ingredients into the sweet potato mixture and beat until well combined. Pour into the loaf tin and bake for 50-55 minutes or until an inserted cocktail stick comes out clean. *To prepare the sweet potato I bake my sweet potatoes by wrapping them individually in tin foil then placing them in a baking dish. I then bake them for between 1-1½ hours depending on how big the potato is. I then leave the potatoes to cool a little then unwrap the foil and peel away the skin with my fingers which comes away very easily. Then I refrigerate the potatoes until needed. Don’t worry there is not a strong cashew taste. I used cashew butter rather than any other nut as I find the flavour much blander than say almond butter so it doesn’t take over. The cashew butter helps to give the bread structure, I wouldn’t recommend leaving it out. By all means substitute with another nut butter if you prefer. This recipe looks great and really want to try, but when is the tapioca flour to be added? Hi Aimee. The tapioca flour is to be added at the same time as the coconut flour. Sorry, the recipe is now amended. Thank you! i want to make this bread but I need to convert for US measurements. Can you help me out??????? Hi Beth, I’m so sorry but I don’t work in US measurements. 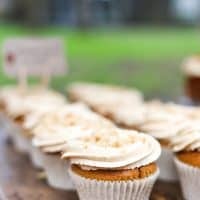 This recipe is incredibly forgiving though so I think if you were to use a weight convertor like the one here at Traditional Oven which I use when converting from cups to grams then I think you would have no trouble at all with a successful recipe. I made this and loved it. I used raw sweet potato. Worked wonderful for texture/density but bland on sweetness so I just spread it with some honey when eating it. I also toasted it first as leaving it at air temp is too hot at the moment & in the fridge is to firm. I think the sweetness must come from the roasting if using the recipe you have. That may explain the bland-ness of my loaf? Hi Caz, I’m happy you enjoyed the recipe. 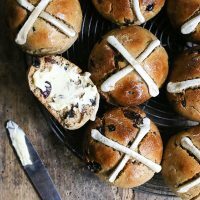 There isn’t really any sweetness in this bread, I use it as more of a savoury option as you would regular bread. You are right that when sweet potato is roasted it encourages the natural sugars so will taste a little sweeter. Sorry Tina, I’m a UK based blogger and learnt to bake using grams and am a great advocate of this method (especially when using digital scales) as it’s ultra reliable and accurate. I find converting cups to grams is easier than the other way round but it’s always a bit of trial and error when you’re converting recipes, otherwise I would add the cups conversions here. Thanks for sharing your story . Love the idea of this bread (happiness) but also like that it uses tumeric as it is so good for you and hard to get into food every day. A thick slice of bread is usually part of European diet ! I have difficulty getting tapioca flour and tried to grind the pearl type but it was too gritty . I am thinking I will replace with gram flour and wondering if you have any comment on this ? Worth a try maybe ? I agree about the turmeric – I now use it a lot and love the colour it imparts. By all means try replacing with gram flour – I haven’t tried it but I’m sure it would work fine. In the past I have omitted the tapioca flour myself and made up the quantity by using more coconut flour or I have used almond flour instead of the tapioca. Let me know how gram flour goes. (I should note that by using gram flour it is no longer a paleo bread but if that is not a requirement for you then don’t worry). Hello, thank you for the recipe. Is there a good substitute for the eggs? Hi Julie! I’m not sure that for this recipe I would suggest a substitute for the eggs, simply because the recipe really does rely on them. 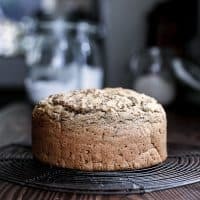 I have a great vegan Irish Soda Bread recipe that doesn’t have any eggs if that might be of interest.